Choose from 12 Hestan signature color finish options. Hestan Team reinvented the restaurant kitchen with award-winning inventive design. Now our engineers, designers, welders and fabricators have turned their attention to the backyard. Guests rave but deep down, You know it could’ve been just a little more tender. juicer. A pinch more salt in the rub. A few seconds less on the flame. Hestan outdoor was born from this same perfectionist passion. Our engineers experimented, innovated, tweaked and tinkered until they created the most powerful, versatile and reliable grill available. The only drawback with this level of performance is you can’t blame anything on the grill. Rise to the challenge. An independent panel of design experts selected the EID Award recipients. All recipients will be profiled in the June 2017 issue of appliance DESIGNand featured on the magazine’s website at http://www.appliancedesign.com/eid, a permanent section dedicated to the competition. 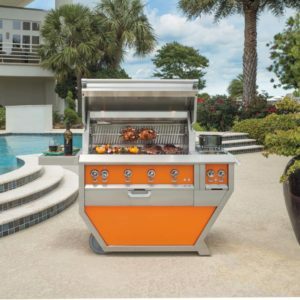 In 2016, Hestan Outdoor grills won Best in Show and Best Gas Grill at the prestigious annual Vesta Awards. Sponsored by Hearth & Home Magazine, the Vesta Awards recognize and honor companies and products for innovation in design and/or technology. Grilling is a serious culinary endeavor. Brines. Marinades. Precision. Heat. Hestan delivers the consistent control vital to perfecting everything from shrimp skewers to leg of lamb. It’s American-made durability that weathers year-round use.